We are wrapping up a very ambitious cover story on the legendary photographer C.S. Fly who took all those amazing photographs of Geronimo and crew at Canyon de los Embudos (Canyon of the Funnels) in March of 1886. Thanks to Tom Jonas and the Arizona Historical Society we are printing all 18 of the glass plate negatives Fly took at Embudos with explanations of how each one happened and who is in them. There are some jaw droppers in there. 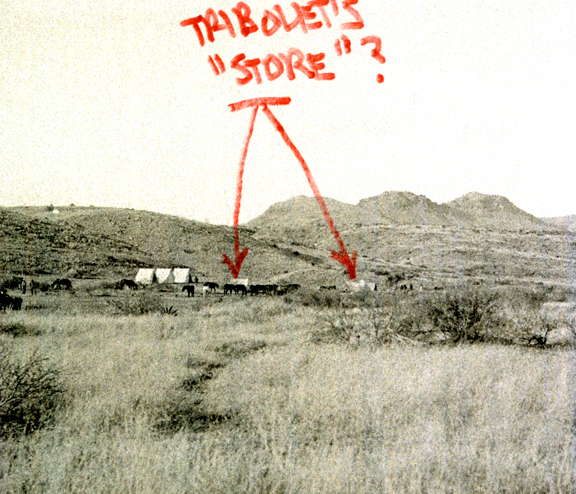 I have been looking at these photographs for at least forty years and I never knew you can see the "store" the notorious Tribolet set up to sell liquor to the Apaches. stating Charles Tribolet's "store" is visible. Of course, it was Tribolet's sale of liquor to the Apaches which unhinged the negotiations. Naiche became so drunk he shot his wife in the leg. When officers went over to the the Apache camp to investigate, they reported the grass was on fire and several of the warriors were riding mules backwards and they were all "drunk as lords." Geronimo and Naiche were still drunk the next morning and bolted back into the mountains, leaving Crook holding the bag (he lost his job over it). The renegades took off on another killing spree, killing over 30 "civilians," including cowboys, herders, freighters, vaqueros, women and babies. It pains me to say this, but these "human tigers" acted more like a biker gang jacked up on speed than freedom fighters, fighting for their homeland. The Apache Chief Chihuahua was also at Embudos and he camped away from Geronimo and his crew because he knew they were bad boys and up to no good. Chihuahua was tired of the fighting and he wanted to settle down. Unfortunately, after Geronmo and Naiche went on their killing spree, all the Chiricahuas were sent to Florida. Fly had a drinking problem as well. In fact, Fly died of "acute alcohol toxicity," He separated from his wife not long after he took these iconic photos because his drinking became so bad. It's doubtful he ever made much money on the "copyrighted photos" of Geronimo. However, the widely published photographs made the G-Man famous and he became a national celebrity, riding in Teddy Roosevelt's 1905 inaugural parade. Because he was so recognizable, he began signing his autograph for a quarter a shot, and he amassed $10,000 in the bank before he too, died from the effects of drinking when he fell of his horse after a night of carousing into a cold stream and passed out. He died of pneumonia several days later. He was 79. When the esteemed historian Robert Utley was asked about the prevalence of drinking among the Apaches and Geronimo specifically, he stated, bluntly, "They were all drunks." It wasn't just the In-dins. Here's what Frederick Remington had to say about the army chasing Geronimo: "Youngsters full of enthusiasm, old men full of whiskey." All of which brings up a serious question: if you took the alcohol out of the equation how much of the senseless killing would have been avoided? I'll put it this way: we would have a lot less to talk about on the pages of True West magazine. And that's sobering. "If drunkards had wings, the sky would be cloudy all day." Last Friday I was at the grocery store in the milk department, when a guy came around the corner with his cart, spied me and said loudly, "I've been a subscriber for five years now and I just have one question for you Mr. Bell." I placed the milk in my cart and said, "Shoot." "How in the hell do you find all the stuff you put in every issue?"